Developed for performance and durability, the TM4 SUMO electric powertrain systems are optimized for medium-and heavy-duty electric and hybrid vehicles such as 6-18 meter buses, delivery trucks, shuttles, tow tractors and more. By allowing direct drive operation, the TM4 SUMO permanent magnet electric motor reduce the powertrain’s complexity and cost, allowing for a simple, efficient and low-maintenance solution. A direct drive system yields over 10% efficiency gains throughout the driving cycle, representing an equivalent gain in battery usage. 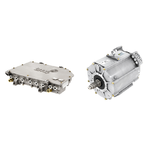 Some of TM4’s SUMO systems are offered with a double-ended shaft option, allowing for easy integration in many hybrid-electric powertrain architectures.